There is rarely any reason to bother with burial of coax and other cable in most ham stations. Towers (if any) and other supports are of modest size and close enough to the dwelling to allow direct entry to the building wall. The one or two antennas that may be further away can usually be services with overhead runs from the support to the building. When the towers and antennas get big they are typically further distant and burial is often needed to avoid eyesores and to reduce interactions between antennas and the the long horizontal runs of cable. Ground mounted verticals benefit from burial of radials and coax to eliminate hazards to people and lawn mowers, and to help prevent the feed line from becoming part of the radial system. Until now I have kept cables overhead or on ground in my present station. Some was intended to be permanent while others were temporary solutions when weather prevented burial in the frozen ground. The time has come to deal with the problem. For the present I have buried the control and transmission lines from the big tower to the rock wall surrounding the house area of my property, and the feed line, control cables and radials for the 80 meter vertical yagi array currently under construction. Once the coax and control lines are out of the hay fields they run overhead to the switching system at the base of the Trylon tower located near the house. This was done to ease maintenance and avoid dealing with tree roots and other obstacles incompatible with going underground. Other than the radial wire all the buried cable is rated for direct burial. No conduits are used. Trenches are dug, the cable laid down and the soil replaced. Many hams swear by conduits while others swear at them. Water, moisture and condensation are always risks with conduits other than in arid climates. Perhaps the only good reason for conduits is to avoid digging when cables must be added or removed. This can be troublesome in many cases. I have always found it best and easiest to go with direct burial. Should I ever need to add cable in future I can easily dig another trench. In this article I'll show how I've gone about it. Radials are the simplest to put down out of the way, except that there's so much of it! My 80 meter array will have up to 2,000 meters of radial wire when complete. Since the radial field must be mowed -- haying is banned in the area since the machinery will disturb on-turf or wires pushed up by frost heaving -- burial was chosen rather than turf staples. With that much wire and uneven ground there is a near certainty of radials finding their way into mower blades from time to time. I did initial testing of the 80 meter antenna with radials on the surface. This is done immediately after mowing to maximize the time to test the antenna and then bury the radials before the next mowing. Then I do it again to add more radials. As I write this I have 12 radials buried and 8 more on the ground for the driven element. My objective is at least 32 for the driven element and 16 for each of the four parasitic elements this year. Even that may be too much to achieve this year with all the other antenna and tower work to be done. To bury the first 4 radials I built a manual sod cutter. This is supplemented with the sharp end of a pick axe to widen the narrow furrow. The latter is necessary since the gap in the sliced turf is so fine that it can be difficult to find in places to push the 18 AWG wire into it with a light push so as to avoid zigzagging up and down and side to side around hay roots. The turf slicer is a length of hard wood with a couple of common steel construction straps that are filed to an edge. This is pushed into the sod alongside the radial and pulled backward. It works quite well although tight tangles of vegetation deflect the blade a small amount. Having two blades allows placing the blade on either the right or left side of the wire (used as a guide), whichever works best. There is little risk of the blade slicing the wire. After cutting the sod the furrow is widen by dragging the pick axe through it. Even with this done it can be frustrating at times to find the furrow and insert the wire. This is so much not enjoyable that it is necessary to constantly remind myself how wonderful an antenna this will be! Since that wasn't enough to sustain me I built a plow attachment to my lawn tractor. With it I can sit and relax while I plow a furrow. It must still be done slowly but it is much less effort. 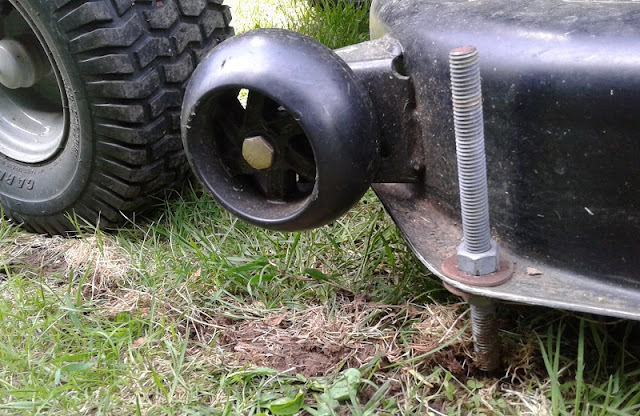 As you can see it's very simple, merely a length of ½" threaded rod through a pre-existing hole on the left side of the mower deck. With the tractor in position and the rod alongside the radial wire the mower deck is lowered and the tractor driven forward. 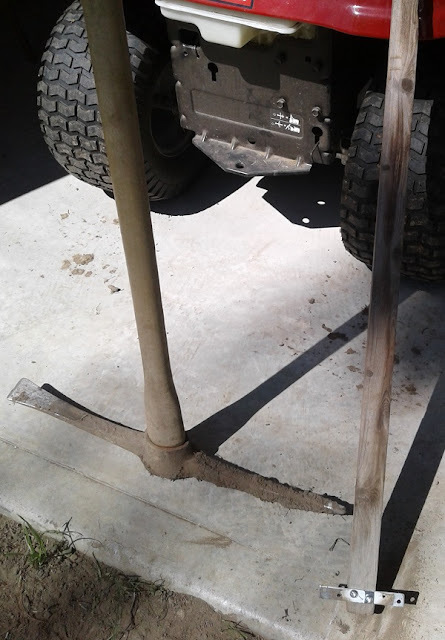 The rod digs into the ground after only an inch or two of forward travel. The threads must be cleaned afterwards so the nuts can be unscrewed and the rod removed. Unfortunately the furrow made this way proved imperfect. Where the ground dips the plow doesn't dig deep or at all. 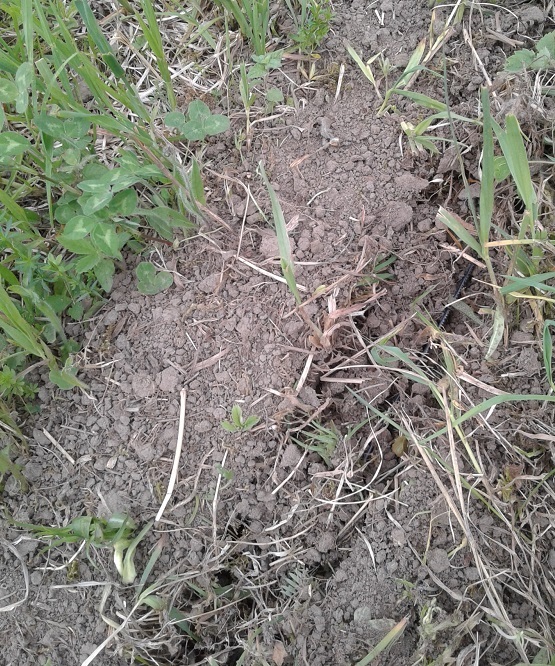 Dragging the pick axe through the furrow is still necessary, after which I went along it on hands and knees to fit the wire into a furrow obscured by infalling dirt and sod that hinged back to where it was before plowing. This is the best I can do for now so I proceed a few radials at a time to avoid being driven crazy with the tediousness of it all. Tick and fly protection is strongly advised. 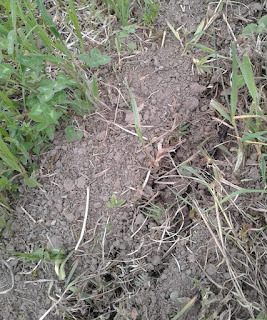 Radials are easy to deal with since they are largely immune to ground conditions and mostly only suffer by injudicious future digging or abuse by burrowing animals. While control cables are nearly as hardy the same cannot be said of coaxial cable. These must be handled with care if they are to survive underground for long, preferably a few decades. 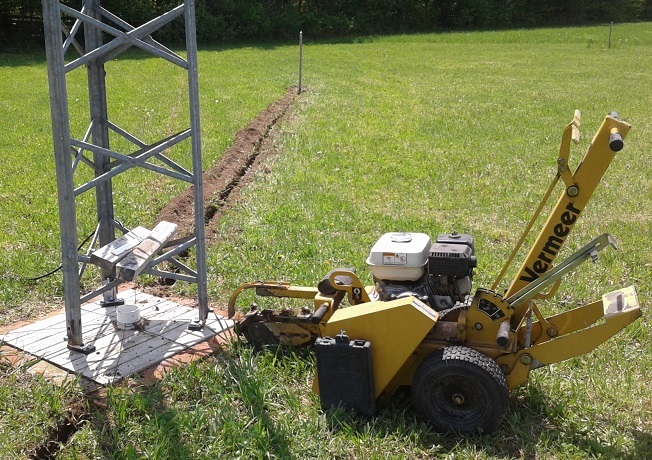 To dig the long and deep trenches for the coax and control cables I rented a trench digging machine. The small one you see in the picture alongside the driven element of the 80 meter array is positioned to begin the third of four shallow trenches for the control cable to the base of the parasitic elements. These trenches are shallow (4" or 10 cm) to speed digging and ease maintenance. Deeper trenches (12" or 30 cm) are dug for the coaxial cables. Despite being about the smallest trencher you can find the machine weighs in at 270 lb (120 kg) and must be moved manually. It's hard work for someone like me whose weight is half that of the machine. After starting the engine the cutter is lowered and begins digging. The depth lever is locked when the cutter reached its target depth. You then stand on the foot pedal which uses a cleat to pull the machine backward. A front cleat (mostly) prevents the machine from kicking forward when rocks and roots are struck. The deeper the trench the longer it takes. One nice feature of this machine is that it will kick out rocks up to ~6" (15 cm) diameter and eat through modest sized roots. It just takes some patience and enough muscle to hold the cutter in position. The carbide bits are incredibly tough. You'll likely notice in the pictures that the trenches are not perfectly straight. There is a torque on the machine due to the cutter not being centred so it tries to turn left (as seen from the operator position). Once I realized this a few minutes after starting it up I took to manually shoving the machine slightly to the right every few feet. That mostly solved the problem. But it doesn't shove easily. Once the trench is dug prepare to get dirty. It is rarely enough to simply dump the cable in and back fill. Try to have the cables sit flat along the bottom of the trench. There's a reason you dug them to that depth. Hard line should be carefully straightened before lowering into the trench since the weight of the dirt alone won't cure rippling. Coaxial cable in particular should be carefully inspected for nicks, abrasions and cuts. A breached jacket will result in water infiltration. If you must use a cable with jacket damage use a liberal amount of a professional grade sealing compound and then rubberized sealing tape and an outer abrasion coating of high quality electrical tape. Don't skimp! Even burial grade coax with a cut in the jacket will succumb to water within a year or two. Hard line such as Heliax with a damaged jacket will survive longer but will eventually fail as well as the copper outer conductor corrodes. When directly buried cable must be replaced or added it is always better to dig a new trench rather than attempt to uncover previously buried cables. 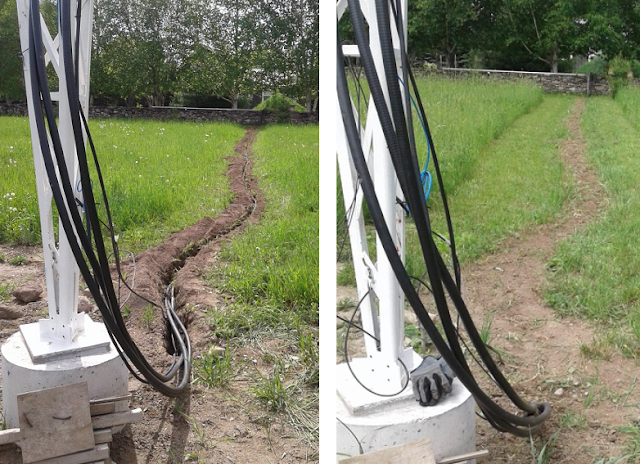 Mark the trench if possible so that when you dig a parallel trench years later you do not dig into the older cables. Putting the dirt back into the trench when you're done is mostly straight-forward and quick. For best results there are a few items to keep in mind. The first is to keep sharp-edged and large stones away from the buried cables. Either dispose of these elsewhere or put them aside until the cables are well covered with granular material. I use a heavy gauge rake to fill the trenches which also serves to filter out stones. Avoid voids under the cables which will fill with water and reduce the risk of section of cable rising to or above the surface where they are prone to damage from mower blades or deer hooves. Sod staples on radials can help but may not be a forever solution. Finally, you may discover that you don't have enough dirt to back fill the trenches. Usually it's the opposite, that you seem to have more dirt than the hole will hold. The reason for the latter is that without compacting the excavated dirt will occupy more volume. This is common in larger excavations such as tower bases. For low volume trenches the machine grinds the soil into smaller grains that tend to be lost in the sod beside the trench. It can be very difficult for the rake to find it all. Find soil from elsewhere to level the surface if you can't otherwise easily level the surface. Look carefully and you'll see that the back filled dirt over the trench from the big tower is higher than the adjacent ground. It is better for the buried cables to let the rain transport to compact the dirt and transport it into voids than to aggressively compact the dirt mechanically. Soon the field will be safe for haying. As I write this article I have back filled all but the coax and control line trench to the 80 meter array. I have to do more work before it is ready to be back filled. Once you back fill a trench it is not easy to undo so be sure to do it right! Trenches are nice but not always possible or desirable. I only use trenches over open ground. When I get near large trees and other obstacles I run the cables overhead. Doing so avoids a lot of work, reduces future risk due to root damage and eases maintenance. When convenient I place connectors on cables at either end of the trench to make it easier to isolate problems and to replace buried cable that has deteriorated. There are a few places that are currently overhead that I plan to bury in future. One example is the short distance between the Trylon tower and the house entry point. All antenna switching and control cable terminations are at the base of the Trylon. Burial must wait until I have a permanent switching system design in place. 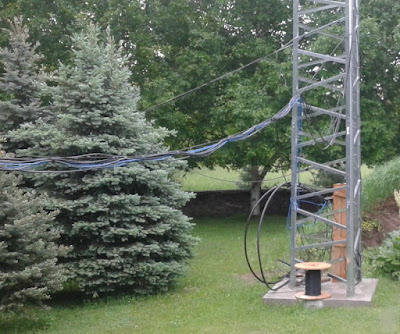 The coax from the Beverage antenna remains on the ground along the tree line from the feed point to a point near the yard where it proceeds overhead to the tower. Eventually I will raise it off the ground where it is easier to maintain and to reduce the risk of animal damage.